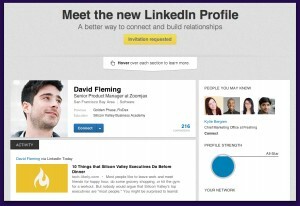 Have you got your new LinkedIn profile yet? The new LinkedIn profile is being gradually rolled out across all its users and it’s looking less cluttered and more colourful with the addition of some funky looking graphics. The new profile has been designed to give you more options for building and connecting with your network and to give you more insights into how your profile is found. LinkedIn are no longer supporting their Applications feature and are replacing this with the ability to add rich media content directly onto your profile. This means that you can add links to images, videos, presentations and documents into the Summary, Education and Experience sections and create a multimedia experience for the people who view your profile. Important to note: this is currently only available if you have already been granted the new profile and if you have previously had LinkedIn Applications in use on your profile. Using rich media content will help your profile to stand out and be more engaging. Adding media content to your profile helps you to blow your own trumpet. Why simply tell people all about yourself when you can show them? – Scroll down the page to the section where you wish to add the content and click on the button that looks like a square with a plus sign in. This is the add media link button. – Once you’ve clicked on the button an Add a link field appears. You should then either type or paste your link into this field. You’ll then preview the content link. If you’re happy with this click Save. If you’d like to make the switch to the new LinkedIn profile asap you can request an invitation. No timescale is being given but LinkedIn say they’re working through requests as quickly as possible. I’ve got my request in. I’ll update this post once my request has been granted! Whichever type of profile you have it is important to have a well managed LinkedIn profile. We offer LinkedIn management as part of our service offering, take a look at that page for more information.